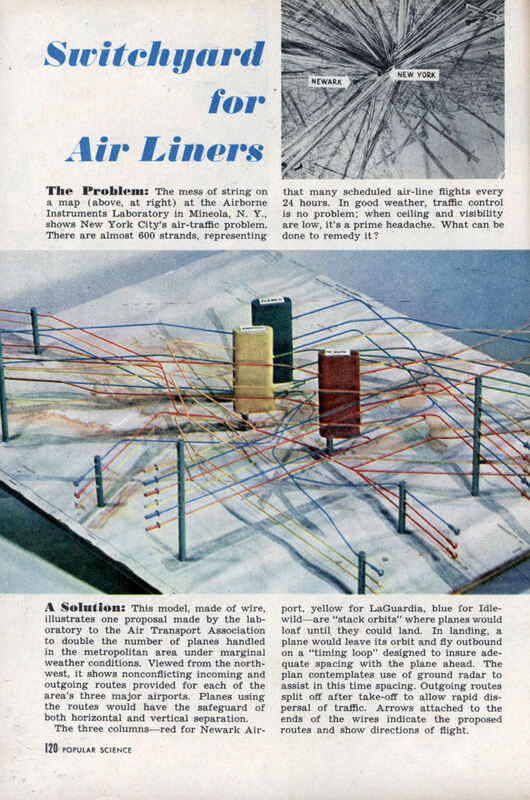 A Solution: This model, made of wire, illustrates one proposal made by the lab-oratory to the Air Transport Association to double the number of planes handled in the metropolitan area under marginal weather conditions. Viewed from the northwest, it shows nonconflicting incoming and outgoing routes provided for each of the area’s three major airports. Planes using the routes would have the safeguard of both horizontal and vertical separation. The three columns—red for Newark Airport, yellow for LaGuardia, blue for Idlewild—are “stack orbits” where planes would loaf until they could land. In landing, a plane would leave its orbit and fly outbound on a “timing loop” designed to insure adequate spacing with the plane ahead. The plan contemplates use of ground radar to assist in this time spacing. Outgoing routes split off after take-off to allow rapid dispersal of traffic. Arrows attached to the ends of the wires indicate the proposed routes and show directions of flight. Sounds like the area airports need to add runways if planes are kept in holding patterns “Stack Orbits?”. Mabye they should stop playing with toys and start hiring some damn air traffic controlers. Hiru: You’d be surprise how (a) sometimes it’s easier to visualize – or even quantify – problems by making 3-d models. The trick is to make the scaling useful. And (b) how much easier it is to get funding from politicians to help solve problems when you can show them a model of the problem. I once made 3d maps of 1980s Alberta Bear Population Study numbers. 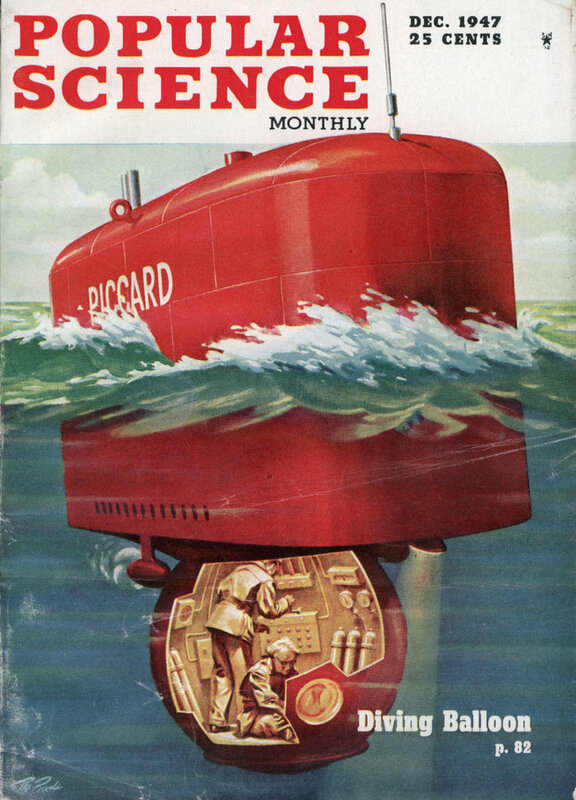 It was strictly for political reasons – scientists could read the tables. Side rant: (I’m a bit pissed that Alberta has killed more polar bears in the last 12 months than have been born in all the zoos on earth – by a factor of about 100. They shoot an average of one per working day, in season. It’s easier to kill bears than to take care of your garbage, when oil and meth are involved.) End side-rant. @ Toronto – I was half kidding, I agree 3D models can be useful in visualizing a problem, but as to Alberta, they have Polar Bears there? Black and Brown sure, but Polar, isn’t Alberta pretty far inland? Here’s something interesting related to airplanes (not bears): http://www.radarvirtuel… North America isn’t that well represented, but check Europe and click an individual plane for details.